Professor Daniel Kerr has spent two decades uncovering American homelessness. The history professor, who joined AU’s faculty this fall from James Madison University, has turned to oral history to gain a greater understanding of the underlying circumstances surrounding homelessness in America and to give a voice to the homeless. This dedication has manifested itself in Kerr’s new book, Derelict Paradise: Homelessness and Urban Development in Cleveland, Ohio. Kerr spent the next several years combing through local archives and continuing to talk to homeless individuals. As his research progressed, the picture of homelessness in Cleveland and in America became clearer. He identified the roots of the modern shelter system in the period that followed the Great Railroad Strike of 1877. The shelter played a clear role containing and monitoring the city’s homeless – the population blamed for prompting the disorder. While the shelter receded in importance following World War II, it reemerged as a key institution in the 1980s when wages melted down and people could not access housing, and urban leaders sought to contain and control the people sleeping on the streets as they promoted Cleveland’s renaissance. 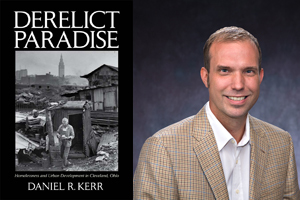 Kerr says he hopes Derelict Paradise will show that “homelessness has deep roots in the shifting ground of urban labor markets, social policy, downtown development, the criminal justice system, and corporate power, rather than being attributable to the illnesses and inadequacies of the unhoused themselves.” Derelict Paradise is the first book in Kerr’s two-book series. Kerr plans to release a second book about the practice of oral history based on his experiences with Cleveland’s homeless.